I received the phone call on a warm June day. A “tree making noise”, sounded interesting, but not too out of the ordinary. A compensated site visit was scheduled for the following day. I arrived at the scheduled time and was quickly escorted through the new upscale house in Lewis Center, Ohio. Of course, the fact that it was a recently built home ultimately sums up primary cause the situation: development without arborist input. The tree, a 16.5 inch DBH, 70 foot tall, shagbark hickory (Carya ovata), was located in a bed in the middle of the back yard, South of the house. Though mostly lawn, other beds containing varying plant material, including several trees, were present around the yard. Upon observing the tree, I immediately noticed a large crack midway up the trunk on the north side. Upon further observation around the south side of the tree it quickly became apparent the crack was actually worse, and, in fact, the tree was hollow. Complicating matters further was the presence of a large active honey bee (Apis mellifera) hive. Additional investigation with my trusty sounding mallet revealed the tree was likely hollow to the ground. I reported to the homeowner my findings and recommended that the tree be removed soon. I explained that it was unsafe to climb due to both the bees and its structural condition. She agreed and accepted my recommendation and requested a bid for removal. I further explained I would need to evaluate my options, since I would like to attempt to preserve the bees, but also needed to evaluate crane access, since a steel fence, with only a small gate surrounded the entire back yard. There was definitely not enough room on either side of the house for access with a large enough crane, so the only possibility would be from the rear, although it would still be tight access and a sloping commute over a neighbor’s turf. The fence was approximately 35 feet from the tree. I phoned the homeowner the following afternoon to inform her that I had made contact with a local beekeeper, at which time she informed me that the tree had just failed at the trunk split, in an unusual for June, 50 mile per hour straight line wind; many other trees throughout the area also failed during this event. Fortunately, her twin daughters were not outside when the tree failed and nothing was damaged other than a small white pine and Washington hawthorn. I instructed the homeowner to stay clear of the tree and I would be up the following day to evaluate the situation. I arrived onsite to find the failed 35 foot top peeled over at a 45 degree angle to the ground, while still attached to the spar. I began removing the canopy, now mostly accessible from the ground, after determining the top was stable and not likely to detach from the trunk. The beekeeper arrived and accepted to take the hive to her farm. My next question was how to extract the bees. I certainly was not comfortable removing them myself, nor working on the tree until they were removed. She agreed to remove them aerially from approximately 30 feet off the ground, if I could get her to them. Fortunately, a small ash tree was located just to the West of the failed hickory and was just tall enough to establish an adequate tie in, just above the split in the hickory, enabling manual removal. The necessity of a crane and the access issues involved were now one less concern. I scheduled with the beekeeper for the following week. I felt that we could simply belay the beekeeper into the tree with rope, saddle and mechanical advantage, by using an anchor point in the ash. Upon further consideration I decided to place a large extension ladder against the hickory to make it easier, and less frightful, for the beekeeper. I ascended the ash after setting the ladder and secured it to the hickory with a sturdy lanyard. The beekeeper suited up in full regalia and ascended the ladder, after being outfitted with a saddle and secured to a second climbing line in the ash tree. I ascended the ash tree, while she climbed the ladder. I did not have any bee protection and only required arborist PPE. Upon arriving at the hive she proceeded to remove as many as bees as possible, essentially pulling out large pieces of the hive with bees attached, while I held the bucket. Other than the incessant and increasing buzz, which I tried to ignore, the swarm of bees was relatively tranquil, though definitely agitated and swarming, but thankfully not stinging. At this point, I was sweating more from the 90 degree heat than the worry about getting stung, although the sight and sound was somewhat disconcerting. She spent about a half hour removing as much of the hive as possible, which turned out to be maybe half of the total number of bees. We both remained unstung. After descending, I realized that many bees were still remaining in the tree and I would now be resorting to plan B, which would entail removing the tree with much of the hive (and bees) still in place, Unfortunately, the failed top and some of the spar below the split would need to be rigged out and could not just be felled. So I would be forced to work in very close proximity to the hive without bee keeper PPE. I had insect repellent available, but felt I probably could work safely around the hive, since I was not stung in the earlier attempt to remove the hive. 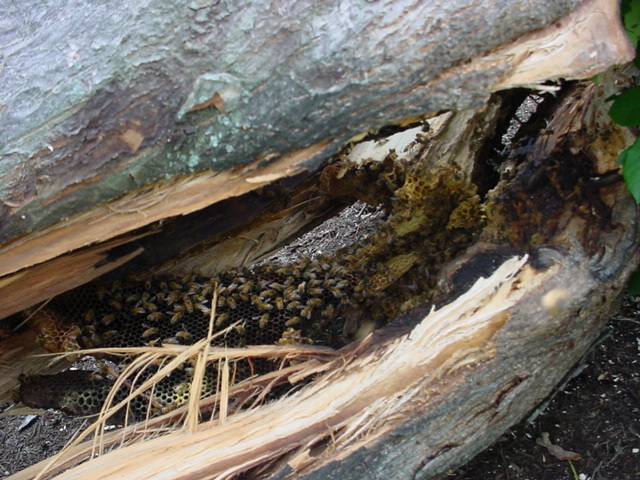 Hindsight dictates that the bees shouldn’t have been dealt with until the tree was on the ground, but the beekeeper indicated that there is no way to predict how an individual hive will behave. My goal from the outset was to save the bees, which certainly would not have been the case with some of the other stinging insects I have dealt with while climbing e.g. baldface hornets. Honey bees are critical to the ecosystem, due to their role as pollinators. Shortly after this project was completed, I began hearing reports of widespread honey bee colony collapse, now attributed to several factors. So it was fortuitous that preservation of this hive was successfully executed. Preservation of the hive seemed to be a tiny bit of remediation for the careless land development which destroyed woods, retaining flawed trees unnecessarily, with no regard for post-construction tree failure and mortality. The bees seemed to reciprocate with good karma, since I only ended being stung twice, both likely because I squished two bees inadvertently while rigging the top. Many bees remained, even after the tree was bucked, so I ended up transporting the entire split trunk section (~4’) containing the hive to be reunited with their hive mates. Although I had no previous climbing experiences with bees, at the end of this engagement both hive and house were preserved. 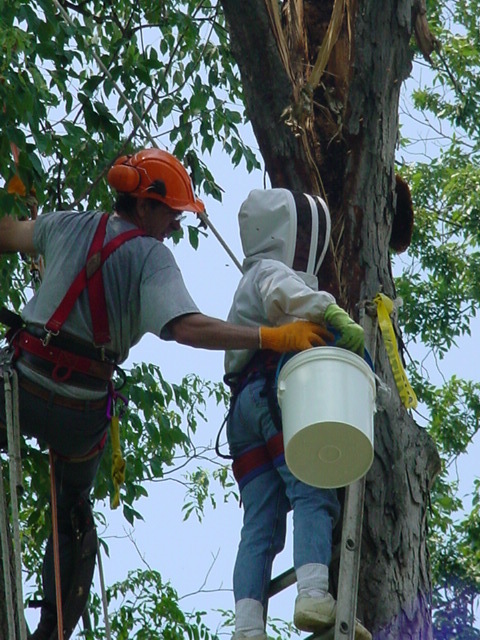 Kennedy’s Arboriculture is a tree consultant serving the entire state of Ohio, including Columbus, City of Delaware, Newark, Upper Arlington, Dublin, Westerville, Gahanna & Hilliard.